Home » awesome duuuuuuude , crime , dan cooper , history » Has the Dan Cooper skyjacking case finally been solved?! Has the Dan Cooper skyjacking case finally been solved?! Two weeks after the fortieth anniversary of his dastardly deed, it looks like the mystery of Dan Cooper might have been cracked at last. And if true, it means that Cooper did survive his crazy stunt after all! In the image above, you see one Lynn Doyle Cooper on the left and on the right, one of the sketches of Dan Cooper (or "D.B. Cooper" as he was erroneously referred to be by early press reports) made from descriptions given by passengers and crew of Northwest Orient Airlines Flight 305: the flight that Cooper hijacked on Thanksgiving 1971. 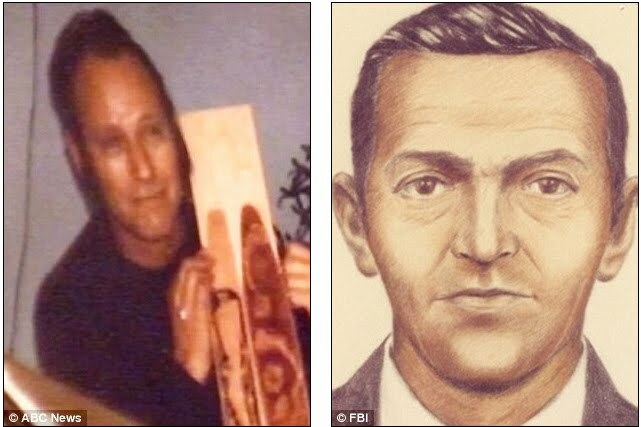 Marla Cooper, niece of Lynn Doyle Cooper, has come forward to tell the FBI that her uncle arrived at her home on the day after the skyjacking. He was severely injured and claimed that he had been in a car crash. But what's more, the FBI is apparently close to matching a fingerprint from Lynn Cooper with one found on a cheap clip-on tie that Dan Cooper wore (and left behind) on the plane before the scoundrel bailed out with a parachute and $200,000 into the frigid night of the Pacific Northwest somewhere over the state of Washington. Lynn Cooper died in 1999. Meaning that if he was Dan Cooper, he got away and was likely laughing about it for almost three decades! Mash down here for more of this story.